“They” say you can tell how old a woman is simply by looking at her hands. I say just watch how she acts in the middle of house a project. I am too stinkin old for this people!!! 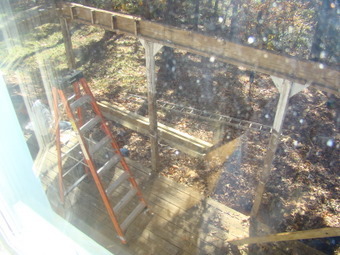 Our back deck is falling apart so we’re having another one built. Now, I thought they were starting on it on Wednesday. But on Sunday night I was informed they would start on Monday! The Husband knows full well that the kitchen isn’t back together. I swear he did this on purpose. 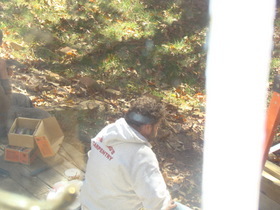 The nice builder men showed up this (Monday)morning with a huge dumpster and a large amount of wood. Lot’s of banging and sawing. I have these little white yappy dogs, Ollie the beagle is chill, but the little white pups…for the love of Pete and all that’s Holy, they are about to implode. let’s just say I’ve had to walk him 5 times in the past 3 hours. Also, we can’t stay downstairs! The nice men are walking around out back and the pups can’t stop screaming bloody murder! Here are the pups finally napping in my fun room after 5 hours!!! This is Mr. Max eating lunch. He’s very nice, I’ve no idea why I’m sneaking around. This is where my deck should be. I don’t think I’d kill myself if I walked out the back door, but I’m pretty sure I’d break something! Ok, so this is a bit of a stressful day and laughing at myself is helpful. What do you do when you’re stressed out? I may need more ideas tomorrow! P.S. It’s now “tomorrow”, I lept out of bed at 4:00 and did lots of work in the kitchen. I’ll post pictures this afternoon! Oh girl…you do have a lot going on! My goodness! Those poor babies want their home back! Just adorable! Oh, I’m laughing so hard, You know how we (meaning women) are, we want it all done to our liking but don’t like the interruptions…I hope you are serving them cakes and coffee off your silver tray….you know they work better/faster when u serve them and keep them happy. Yes, I think I am going to argee w/Mike, he thinks after all this, you won’t ask for remodeling so freely…they are all alike. haha. Just remember how it will all be so new for the holiday’s. nothin’ like a house project to create stress…double that, and, well, i’m surprised you didn’t start yappin’ with the dogs! i’d lock the doggies in a room without windows so that they can’t see the men, or i’d let them greet the men so that they wouldn’t bark for hours on end at them. then you might not lose your mind! i’m really surprised that the beagle is chilled. 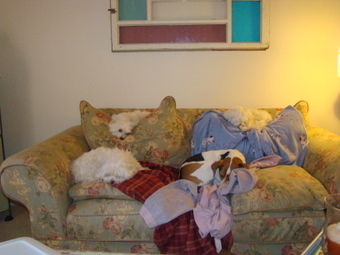 we had one, and he had his couch potato moments, but if people were outside, the barking would go on and on. all this to say, i feel your pain. my suggestion for how to cope? eat chocolate! it tastes way better than coffee, and has less caffeine, which is not good for nerves! happy day to you! can’t wait to see the kitchen pics. i have a feeling we’ll have to talk on the phone about books…i’ve read both the marisa de los santos books as well. wonderful!! have you read the stephenie meyer twilight series? i haven’t, but it’s all the rage. okay, as you can see, i can be long-winded too! Loved these pics. My stomach flips over thinking about you walking out onto the gone deck. BE CAREFUL. Hope these guys don’t think you’re stalking them!! Stress relief? For me it’s yoga. Is that sofa Ralph Lauren? I think I have the matching comforter somewhere around here. Your poor puppies. Can they not visit one of your children so their little tummies can have a rest? They are so pitiful. When I am stressed I usually lower my voice. My tone goes down and my voice gets quieter. I have taught my children that this does NOT mean I happy, it means I am keeping myself from screaming. This is what I do when I am about to implode. Otherwise, I turn to laughter. I love me some laughter. Or prayer. In the case of loud noise, I try to get away from it. I can’t handle too much noise. How many days do they project this job to take? The deck too? OMG, the kitchen displacement would drive me batty alone. Hang in there, the only thing I can say is imagine if you also had young children still at home running underfoot as well and you may feel a small sense of relief in your current state of upheaval! Okay, seriously Mike put chairs in front of the door, we were afraid I’d get up in the middle of the night to take out a pup and drop to my death…actually Mike didn’t want to have to wait on me hand and foot while my broken bones healed. This IS something I’d do. And if I had little children at home I’d be under my bed sucking my thumb, at least at 47 I would, at 27 I could have handled it! Where is Gitz when I need her? I just want to curl up on that couch with those pups. My obvious solution: FOOD. S’mores to start. If you have oreos, stick them in the freezer and pick a couple out every hour. Nothing on earth can make a girl happier than a frozen oreo. I suggest pasta in the evening… lots of pasta. It will fill you up and make you sleepy so you won’t feel like getting up, walking out on the deck and breaking your leg. Riley and I would like to tell you we TOTALLY understand. Not about the construction but about the tender tummy. Since I have been feeling worse Riley’s been throwing up. And while I appreciate the enormous empathy, this cleaning up dog puke is not helping!!! He’s getting a lot of sympathy, though. I love snuggling. I am whoozie from looking at those deck pictures! Call me and I will bring a Grande Mesto over and scale the front porch and bring you coffee!